Take control of your quoting process. Salesforce CPQ automates your configure-price-quote and billing processes so that your team can quickly and easily build accurate quotes and close deals. 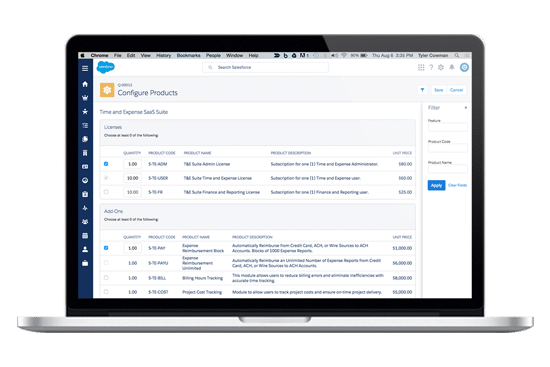 Your sales reps can use Salesforce CPQ’s intuitive product configurator to create both simple and complex customer quotes with consistent and accurate pricing that respects your business rules and channel partner commitments. With one click, deliver a fully-branded quote for immediate approval, with relevant product documentation, terms and conditions, and support for electronic signatures. Up-to-date product configurations and customer-specific pricing take the guesswork out of building and delivering quotes. With guided selling, cross-sells and up-sells are no longer left to chance. Pre-determined volume discount levels and automated approval workflows provide governance peace of mind. Deliver quotes with products and services that can be quickly invoiced and provisioned. Territory-based pricing, support for multiple currencies, channel management tools, product bundles, and payment and commission tracking support your company’s geographic expansion. Subscription management drives recurring service revenues and customer retention. Nubik’s QuickStart implementation for Salesforce CPQ features a series of workshops where we jointly discover your specific quoting needs and governance requirements. Leveraging interviews, surveys and questionnaires, we work with your sales managers to understand your unique business processes. We then implement them in a cohesive, fully secure CPQ system. Finally, we provide training and knowledge transfer, empowering you to manage your ongoing quoting needs. Deploying a CPQ solution is a great time to rethink and optimise the customer engagement and quoting processes. By reengineering supporting business processes, you can achieve dramatic gains in sales rep productivity, reduce the time from quote-to-cash, and improve customer-delivered value. Nubik’s CPQ experts are here to support you as your CPQ needs and usage evolve. Leverage Nubik’s experience in implementing a range of CRM, billing, and financial management solutions. Extend your quoting efforts with Salesforce CPQ’s billing automation, online invoicing, and channel partner community support. Complete the fully cloud-based quote-to-cash cycle with financial management solutions by FinancialForce, including accounting, revenue recognition and forecasting. With multiple certified Salesforce SteelBrick Blue Belts on staff, extensive experience with the Salesforce platform, and a commitment to continuous learning and certification, Nubik has the ingredients that you need to make your Salesforce CPQ deployment a success. Thanks to Nubik’s highly collaborative approach and our team of experts, your CPQ solution will deploy on time and on budget, providing you with tangible business value from Day 1. Sign up for a free online demo about Salesforce CPQ and learn how to automate your CPQ process.